Coconut trees are a significant and very valuable resource, with such a wide variety of uses, and they are fully sustainable when managed properly. 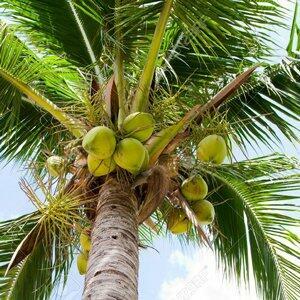 The coconut tree is a type of palm tree. It grows best in hot, humid environments, especially in sandy soil. Most coconut trees grow in the tropics and subtropics in wetter environments. The various materials available from the tree and some of their uses are described below. T he fruit of the tree is not technically a nut, but a drupe (sometimes called a stone fruit). It is made up of layers, generally called the husk, the shell, the flesh and the water. Each of these layers has different properties and uses. The white flesh (or meat) is the kernel of the nut. The flesh can be eaten fresh or stored in the fridge for a few days. However it is usually dried and then it’s known as copra. Copra is turned into coconut milk, oil and meal. Coconut milk and cream, made from copra, are popular food ingredients. They are widely used in many Asian cuisines for example. The milk is also an excellent hair conditioner. Applied to your hair and scalp and rinsed out after a few minutes, it will make hair soft, shiny and healthy. Copra can also be turned into coconut flour, which is often used as a gluten-free substitute in recipes. This oil is very popular as an ingredient due to its unique flavour. It is used as a replacement for butter in some recipes. This oil has a much higher saturated fat content than other food oils, such as olive or canola, and should not be eaten in large quantities. However, in small quantities it helps make up the balance of fats that human’s need for optimum health. It is one of the best high-heat cooking oils. The highly saturated fat content means that when it is heated it does not oxidise as much as other oils, and is therefore less harmful to health. The oil is nearly 50% lauric acid which is a type of fatty acid. As a safe and stable oil it is used in soaps, lotions and cosmetics. It is readily absorbed by the skin and is therefore an excellent moisturiser, it also has anti-inflammatory and anti-microbial properties. 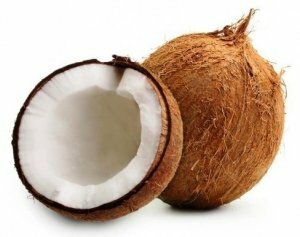 Coconut meal is the fibre left after the production of oil and milk. It is used as a livestock feed. Coconut water is not the same as the milk. It is the liquid locked inside the nut when you break it open. With many electrolytes, it makes a refreshing and healthy drink. Both the husk and the shell can be used for fuel and are a source of charcoal. Activated charcoal manufactured from coconut shell is extremely effective for the removal of impurities. A dried half shell with husk can be used as a scrubber and to buff floors. Shells are also used as bowls and utensils (spoons and ladles). They are manufactured into a variety handicrafts, from buttons and musical instruments to toys and souvenirs. Coir is the fibre from the husk of the coconut. It is used in ropes, mats, door mats, brushes, and sacks, as caulking for boats, and as stuffing fibre for mattresses and pillows. It is used in horticulture in potting compost. They can be used as natural scrubbers to clean dinner plates, cups, and other vessels and even the floor. Coconut husks are also used as a craft material. The leaves are made into brooms and brushes. They can be woven into baskets, mats and other products. They are commonly used for thatching roofs and can be used to make fences and temporary shelters. In some countries they are used as cooking ‘wraps’. The dried leaves can be burned to ash, which can be harvested for lime. Timber comes from the trunk, and is increasingly being used as an ecologically sound substitute for endangered hardwoods. The wood is used in construction of housing and other structures, like small bridges and fences. It is also made into furniture and homeware. The trunks were also traditionally used hollowed out as canoes. 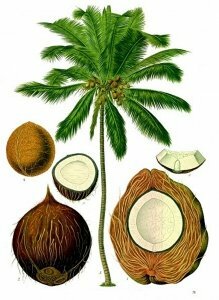 The sap derived from incising the flower clusters of the coconut is drunk. It is known as neera, toddy, tuba, tuak or karewe. When left to ferment it becomes palm wine. Palm wine is distilled to produce arrack. The sap can be reduced by boiling to create a sweet syrup. It can be reduced further to yield coconut sugar also referred to as palm sugar or jaggery. Coconut flowers have many medicinal uses. They are an ingredient in many traditional remedies, especially medicines for new mothers.